The iconic Porsche 911 has been given a new lease of life with more power, more efficiency, and a range of turbocharged engines. The Cabriolet version also throws in open-air thrills on top. When it comes to performance cars, Porsche knows its stuff, and this revised sixth generation ‘991’ Porsche 911 remains the benchmark for both car makers and customers. It loses very, very little in the transformation from Coupe to Convertible, meaning the Cabriolet is one of the very finest cars of its type. Interested in buying a Porsche 911? 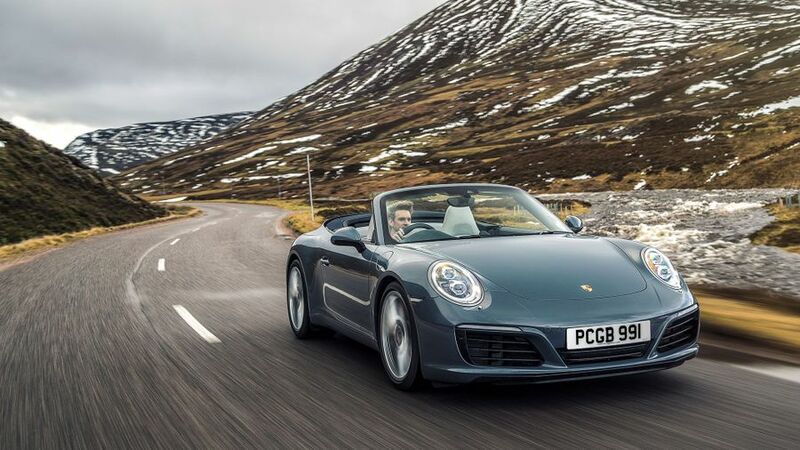 The Porsche 911 is a handsome car whichever bodystyle you pick, but while the Coupe could be accused of looking a little conservative and the Targa a little awkward, the Cabrio looks exotic and cohesive. The silhouette is sleek and aggressive, no matter whether the fabric roof is up or down, and unlike the Targa, it gives you a ‘proper’ wind-in-the-hair experience. The refreshed model for 2015 has a new set of angular-looking LED daytime running headlights, the wing mirrors have been relocated into the doors and 20-inch alloys now come as standard on the Carrera S. You also have wider air vents at the front, along with a new, close set twin-exit exhaust. Cheaper models have smaller alloys, and the engine, trim and variant (4S, Turbo, GT3, etc.) will largely determine how the car looks, with the sportier variants gaining plenty of go-faster add-ons. As with all 911s, you can also customise everything, with loads of different options for the wheels, paint, brakes, badges, and so on, so that no matter what your taste, you'll find a 911 to suit it. Desire is in the detail, from the front facia that gives a nod to the old five-dial layout, right through to the novel car-shaped key. 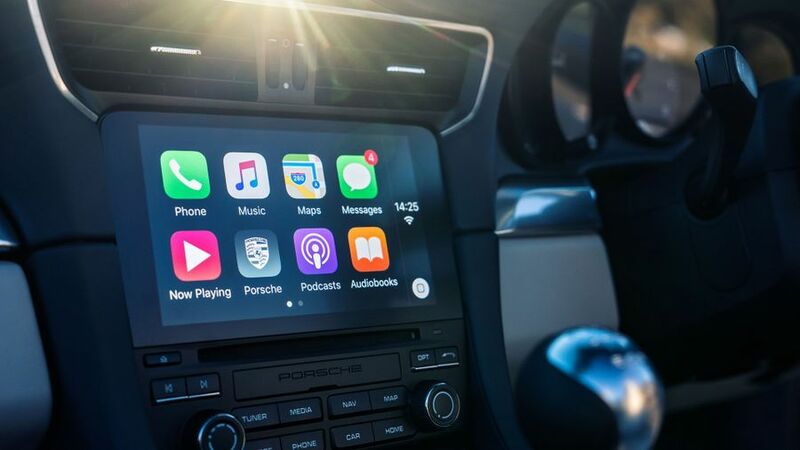 The centre console is simpler than it was before, with a touch-screen display, Apple CarPlay connectivity, and fewer buttons dotted on the centre console. All the materials – from the leather to the real aluminium slivers in the doors – are as high in quality as we have seen on any sports car, although the cabin does feel decidedly old-school in layout and a touch over-complicated when compared with the likes of the latest Audi R8. There are signs of modernity, including a sharp LCD screen providing driver information inside one of the dials. The pedal and seat position is nigh-on perfect, visibility is surprisingly good for this type of car, and all shapes and sizes of driver will be able to get comfortable easily. If there was ever a brief for an everyday supercar, the Porsche 911 nails it. In the car park, it’s still relatively low-key and compact so remains one of the easier sports cars to live with. There’s a reasonable amount of load space – the front boot remains unchanged at 135 litres, and while the rear seats are, like in the Coupe, apologetically small for people, they do afford you some handy extra loadspace for bags. There’s also the fact that many of the 911's rivals don't have rear seats at all, and if you fold them down, you'll be surprised by how much stuff you'll be able to squeeze in. One complaint is the shortage of storage space in the cabin. Trying to get even small items into the narrow, oddly shaped door pockets can be a real faff. The coffee cup holders also provide a slight area of nervousness, because once they’ve been unfurled rather beautifully from the dashboard, they cause your beverage to bounce around precariously over a lot of those important electronic controls. Purists will tell you the 911 Cabriolet isn’t as sharp or as deft as the Coupe, and as such, isn’t as accomplished as a driver’s car. In fairness, they are right, but the truth is that the differences are so minute that most drivers won’t notice, and even if they do, they probably won’t care. It still has that wonderful balance of instinct and analysis when you want to push, and feels effortlessly fluid in working with the driver. The longer wheelbase has also given this car more GT-like pretensions when you need to hit the motorway. Most pleasingly, the tiresome road noise that bothered generation after generation of 911 has been eradicated. At lower speeds, there’s a compliance and composure that would feel good in a family hatchback, never mind a high performance sports car. Every model in the range comes with adaptive dampers, so it can be as supple or sporty as you desire at the press of a button. The new electro-mechanical steering has (marginally) dialled back some of the communication levels of previous hydraulic setups, but it’s still direct, well weighted, offers fine feedback and saves fuel. The car comes in both rear- and four-wheel drive formats, and both have tenacious levels of grip and traction – outstripping almost all its competitors in this regard, both through corners, and off the line. This means you can exploit as much of the performance as you desire, rather than having to constantly manage the throttle, while waiting for the wide rear tyres to hook up. With the 911 Coupe, the range is so varied and complex that it feels like there are more models on sale than stars in the sky. Mercifully, the choice with the Cabriolet is much simpler. 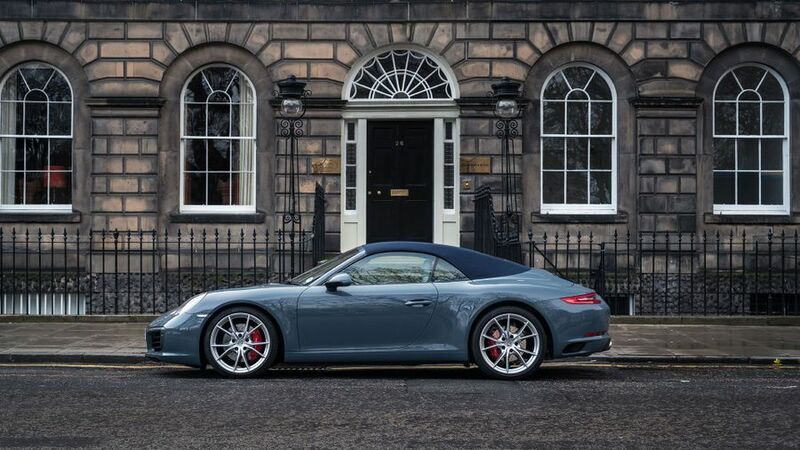 The entry-level Carrera has a 3.0-litre six-cylinder turbo engine producing 364bhp, which will be enough for many drivers, while the Carrera S gets the same motor, but with a higher output of 414bhp. That makes the S our favourite of the bunch, because it provides a useful bit of extra sparkle over the Carrera, but without taking the price of the car – or the rate of acceleration, for that matter – astronomically high. The Carrera 4 and 4S models have the same engines but with four- rather than rear-wheel drive. 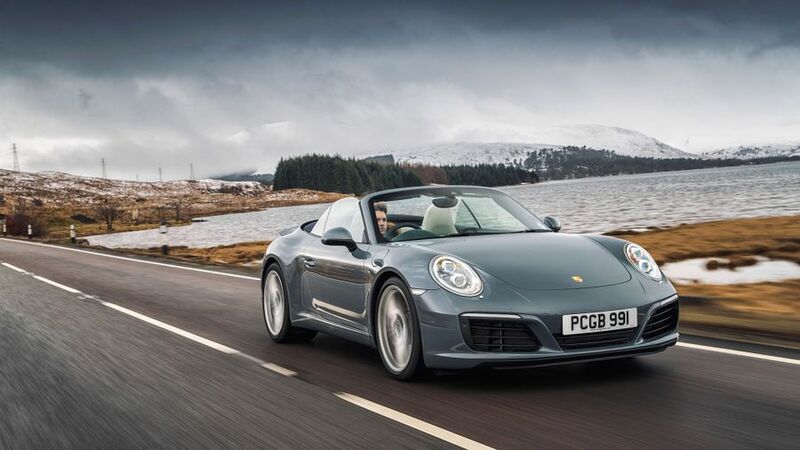 The tastiest versions of the Cabriolet range are the Turbo and Turbo S models, which have 3.8-litre engines giving 532bhp and 573bhp, respectively. Both are mind-bogglingly fast, but while they’re incredibly exciting, we reckon these models are overkill, both in how rapid they are and how much they cost. The Turbos both come with the PDK twin-clutch gearbox as standard, while it can be added to the more humble versions as an option to replace the (clunky and sometimes slightly confusing) seven-speed manual gearbox. You can’t really go wrong with the PDK thanks to its immediate reactions and slick shifts. How a 911 Carrera S can simultaneously pump out 414bhp, while delivering 36.2mpg and emitting CO2 at a rate of just 178g/km (PDK), is pretty astounding. Thanks to its long final ratio, even the manual model is not too thirsty, especially when compared with rivals with larger V8, V10 and V12 engines. The insanely quick 911 Turbo and Turbo S still both manage a combined figure of more than 30mpg. Don’t get too comfortable, though, as servicing your Porsche 911 will not be cheap, and neither will the bills for insurance or tyres. That said, these bills will be comparable with – if not cheaper than – they will with the 911's rivals. One word of advice: Porsche is rather fond of making you pay through the nose for every last piece of equipment, and adding too many options can add thousands of pounds to the transaction price, so make sure you spec your car carefully, and ensure that everything you want is fitted. Remember that the options you choose will also impact on the resale price, so choose wisely. Our strong owner review ratings – not to mention the fact 80% of all global 911s sold since the 964 are still on the road – are a pretty good indication that you are buying one of the most coveted and reliable sports cars in the business. You also get a three-year, unlimited mileage warranty, and there have been few reports of this generation of 911 going wrong. All versions get twin front, side and curtain airbags, as well as a sophisticated electronic stability control called Porsche Stability Management (PSM). Security Research Centre also scores it a maximum five-star rating for resisting drive-away theft. The latest generation of 911 has stronger brakes than before to improve stopping distances in an emergency, and a number of active safety systems are available as options. These include adaptive cruise control, lane departure warning, a speed limit warning, and an Isofix mounting point for a child seat on the front passenger chair. However, the latest 911 does not have autonomous emergency braking, unlike some of its rivals, including the Audi R8 and Mercedes AMG GT. It hasn’t been tested by Euro NCAP, either, in any of its various forms. 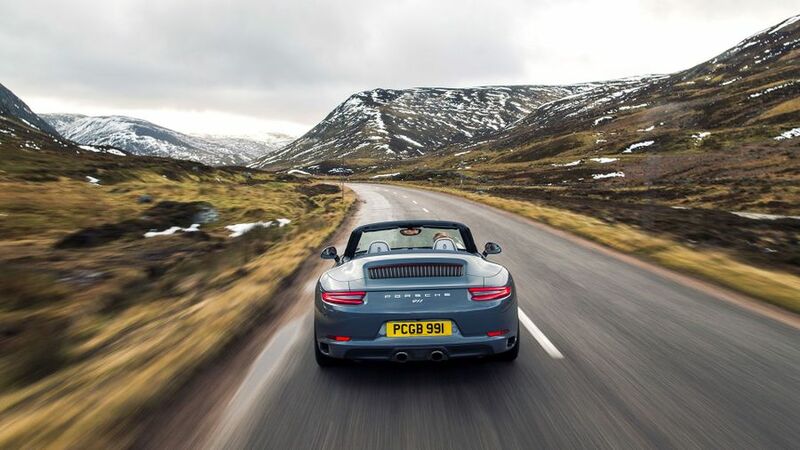 The standard Carrera models offer the best value for money, but still come woefully short of offering the kind of equipment you'd expect on such an expensive, exclusive sports car. All models have dual-zone climate control, alloy wheels, Bi-Xenon headlights and leather upholstery, plus the touch-screen sat-nav and infotainment system, a reasonable nine-speaker stereo and DAB radio. However, cruise control, Bluetooth, parking sensors, heated front seats, and other essentials are all curiously absent, and only appear (at some cost) way down the options list. 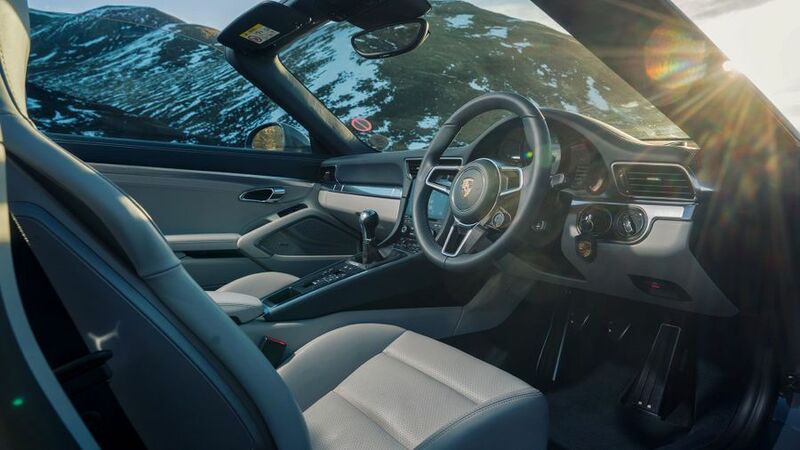 Only the Turbo model receives substantially higher equipment levels than the base Carrera models, as it should considering the eye-watering price tag. The options list also includes a host of personalisation and performance upgrades, from carbon ceramic brakes, to different appearance packs, paint finishes and decals, but you don't really need any of it, and we'd spend the money on things that'll come in handy on every drive. 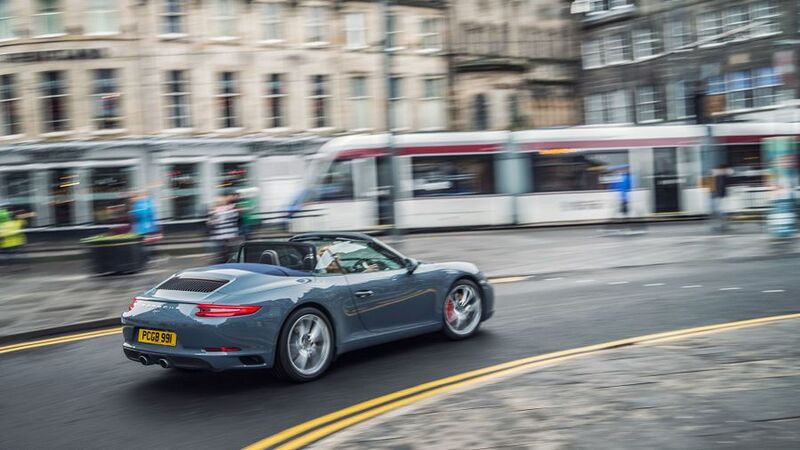 The latest Porsche 911 is one of the best sports convertibles out there. It’s more complete than ever: faster, better riding, better handling, more usable and more refined. The turbocharged engines do mean that occasionally, the flagship Porsche now feels more like a finely tuned appliance than a sports car, but there's no arguing with the increase in real-world performance and improved economy. It's also still one of the few sports cars that's as discreet and practical everyday as it is exhilarating when the mood strikes you.